With over 1.23 billion monthly active users, Facebook is one the ultimate places to engage, influence, and connect with potential customers. In this, properly leveraging Facebook Advertising can help you find, reach, and interact with a precise audience. How can you maximize the efficiency and effect of your advertising budget? 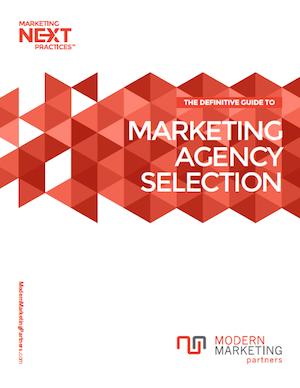 Modern Marketing Partners, a Chicago Business to Business Marketing Agency, has released a new whitepaper featuring the best practices in developing a Facebook Ad that will garner likes and build business. Why should you be advertising on Facebook? The benefits almost speak for themselves. Greater Brand Awareness: Facebook advertisements generate a 31% greater brand awareness than the online advertisement average. Better Ad Recall: Facebook advertisements generate a 98% greater brand recall than the online advertisement average. Higher Share of Conversions: Facebook advertisements generate a 192% higher share of conversions than the online advertisement average (and have a 35% lower cost per conversion). What are Terms of Facebook Advertising Measurement Success? Page Likes: The total number of Page likes you received within 24 hours of someone viewing or 28 days after clicking on your ad. Campaign Reach: The number of unique people who saw ads from your campaign. Clicks: The total number of clicks your ad received. Avg. Price: The average amount you paid for each click or per 1,000 impressions.